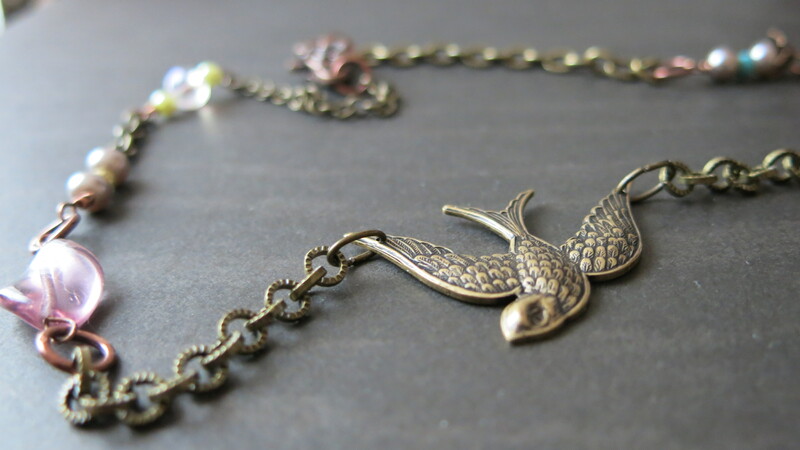 The Swooping Swallow Handmade Necklace with glass pearls, copper, brass findings and chain, fancy copper clasp is a lovely addition to your jewelry box. The necklace is handmade by me with a lot of love! The pearls and beads are hand-wired by me. I used different antique chains to give this necklace a custom-made piece of art! The necklace is 20 inches long (51 cm). The colors in the necklace are a light green, light purple glass bead from early 1980s, a little spot of turquoise from a little bead from the 1970s and glass lavender gray glass pearls. There is a gorgeous clasp out of an antique color copper clasp with a flower detail. The necklace feels great on and is not heavy!